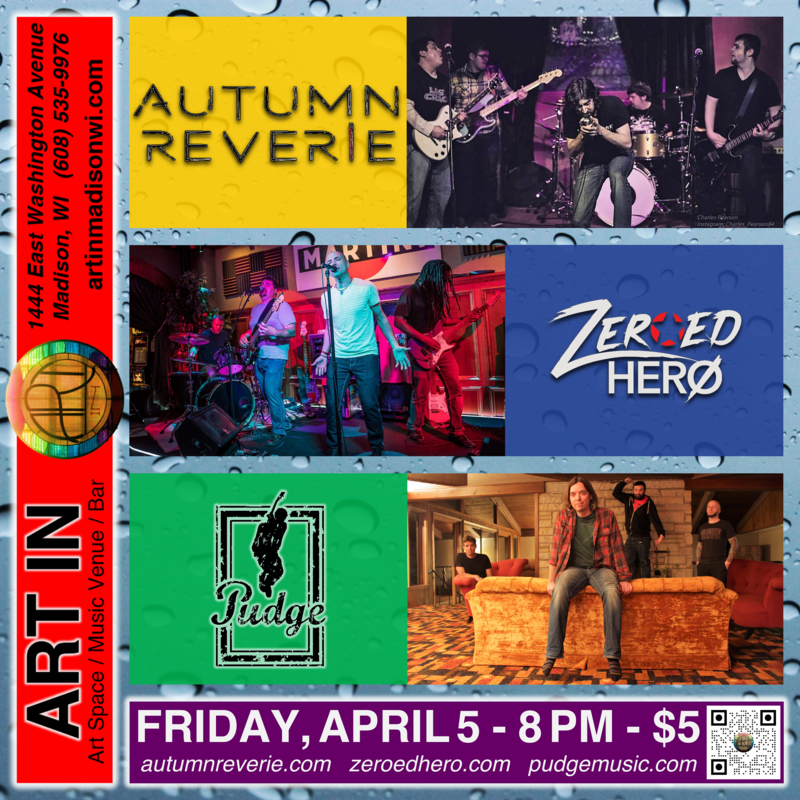 Autumn Reverie w/ Zeroed Hero and Pudge at Art In Friday, April 5th. $5. Doors at 7pm, rock & roll at 8pm. Autumn Reverie is an explosive post-grunge band out of Madison, WI known for their high energy performances no matter what the crowd or venue size. Autumn Reverie has seen success after their self titled release including local radio play and having the pleasure to share the bill with international acts such as Bush, Chevelle, Shinedown, Filter, and Art of Dying. Zeroed Hero pours a classic blend of ’70s and ’90s style rock that’s more Muhammad Ali than Mike Tyson, featuring tight, riffy guitars and smart, thoughtful lyrics presented with sweet, memorable harmonies. Their high-energy live concerts built on visceral rhythms, immersive grooves, rich melodies, and powerful harmonies showcase the strength of the songs on their debut album Love Letters to a Mannequin. Pudge is a band with a unique approach to their music. Hailing from Appleton, WI, the band’s story has roots that date back to the late 90s. Inspired by artists the likes of Nirvana, The Angry Samoans and Mudhoney, the group managed to create a really direct sound, loaded with abrasive guitar tones and memorable melodies. The band’s self-titled debut release dates back to 1999. They subsequently released the albums, “Closer to You” and “Open Cuts”. The band is now back on the scene with a new EP and a single, fresh off the press in 2018, including “Pachyderm Sessions EP, released last August, and recorded at the iconic Pachyderm Studios, where Nirvana famously shut the world out to record their acclaimed third album, “In Utero,” alongside producer Steve Albini. Come as you are, be nice, respect. Be sure to tip the bartenders & servers. Art In is an independently owned and operated art space and venue with an attached pinball arcade and bar named Maria’s. Presently, Art In leases space to an additional taproom, The Parched Eagle. Art In is a LGBTQIA+ friendly, minority friendly, diversity friendly, all-inclusive safer space.